Located just about 1 km from the Kandy lake round and 2 km from Kandy city center SOLAR POWERED GREEN ENERGY ECO FRIEDLY Kandy Back Packer's Hostel offers accommodation for guests with fully air conditioned rooms, such as private rooms with ensuite bathroom and mountain view balcony, standard double room with shared bathroom and female, mixed dormitory rooms. It also features stable and complimentary WiFi access and private parking, a common lounge, rooftop terrace, small library, shared kitchen and A YEAR ROUND OUTDOOR POOL. The hostel team arrange a cookery class every evening to the guests who are interested and offer Sri Lankan style vegetarian dinner for all the guests in rooftop kitchen and open dining area where all can gather and share there experience, meet with people from different countries and cultures. And also offers breakfast, tea and coffee. 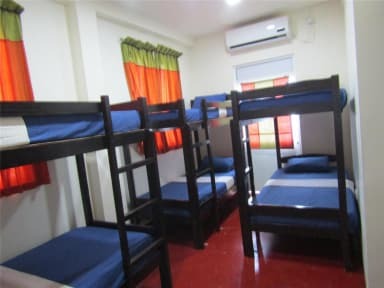 Assisting with travel arrangements, scooter and car rental,airport shuttle, and all other needs of the guests are the other facilities provides by the hostel team and dedicate to make their guests "feel like home" environment in the hostel. There is very cheap and classy tasty food available in our adjoining restaurant just 10 meter from the hostel.Also the hostel has the facility for getting free delivery from KFC, Mac Donald and Pizza hut because of the close proximity to the city. The hostel situated just about 2 km from the city center, Kandy railway station and the main bus station. It's 20 min. walk in the lake round to the famous buddhist Tooth Relic Temple,5 km to the Mahaveli river and 7 km to the royal botanical garden in Peradeniya. Nearest airport is Bandaranayaka airport 83 km from the hostel. In Line with what you pay and overall good value for money. Plus Food is very good and the hostel offers cooking classes included + breakfast. Overall It is REALLY cheap. 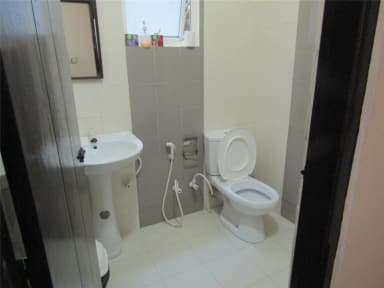 Minus 2 bathrooms per 12 people and not very clean. Mosquitoes bite you overnight as there are no nets.